USPA NEWS - Pirelli HangarBicocca presents “Igloos” (25 October 2018 –24 February 2019), a show by Mario Merz (Milan, 1925–2003), bringing together his Most Iconic Group of Works : the Igloos, dating from 1968 until the End of his Life. Curated by Vicente Todolí, Artistic Director of Pirelli HangarBicocca and realised in Collaboration with Fondazione Merz, the Exhibition spans the Whole 5,500 Square Metres of the Navate and the Cuboof Pirelli HangarBicocca, placing the Visitor at the Heart of a Constellation of over 30 Large-Scale Works in the Shape of an Igloo : an Unprecedented Landscape of Great Visual Impact. Pirelli HangarBicocca presents “Igloos” (25 October 2018 –24 February 2019), a show by Mario Merz (Milan, 1925–2003), bringing together his Most Iconic Group of Works : the Igloos, dating from 1968 until the End of his Life. Curated by Vicente Todolí, Artistic Director of Pirelli HangarBicocca and realised in Collaboration with Fondazione Merz, the Exhibition spans the Whole 5,500 Square Metres of the Navate and the Cuboof Pirelli HangarBicocca, placing the Visitor at the Heart of a Constellation of over 30 Large-Scale Works in the Shape of an Igloo : an Unprecedented Landscape of Great Visual Impact. In the Space of the Navate, the Exhibition Itinerary unfolds through sets Displayed in Chronological Order, starting from the First Igloos conceived in the ’60s such as, to name but a few : Igloo Di Giap, 1968, and Acqua Scivola, 1969. Among those of the ’70s, Igloo Di Marisa, 1972 and ‘If the hoar frost grip thy tent Thou wilt give Thanks when Night is spent’ (Ezra Pund), 1978 are featured here. The Evolutions of the ’80s, the Period in which the Igloos become more Complex, Doubling, Tripling or Intersecting, are represented by Works such as : Igloo Del Palacio De Las Alhajas, 1982 and Chiaro Oscuro, 1983. Representative of the ’90s is the Senza titolo, 1999, created for the Museum Park on the Occasion of the Solo Show at the Fundação de Serralves, also curated by Vicente Todolí. Through his Work, he investigates and represents the Processes of Transformation of Nature and Human Life, using Elements from the Scientific-Mathematical Field, such as the Spiral and the Fibonacci Sequence, and, from 1968, introducing what would remain one of the Recurring and Most Representative Motifs of his Practice for more than 30 Years : the Igloo. The Delicate Precariousness of these Installations takes on Major Symbolic Importance, sometimes a Political One, opening up to the Artist’s Reflection on Contemporary Living, as Merz himself states: “the Igloo is a Home, a Temporary Shelter. 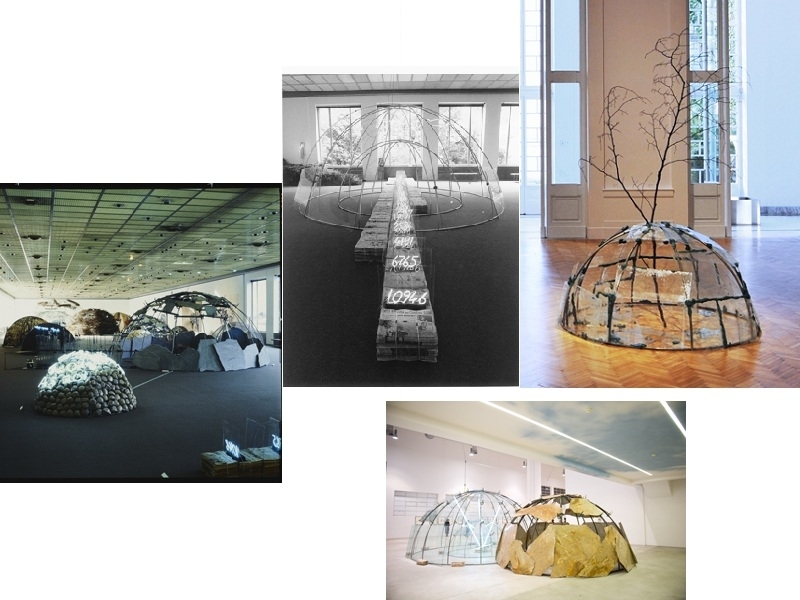 Since I consider that ultimately, today, we live in a Very Temporary Era, for me the Sense of the Temporary coincides with this name : Igloo” (Mario Merz, taken from “In Prima Persona. Pittori e scultori italiani : Mario Merz, Giulio Paolini, Mimmo Spadini, Alighiero Boetti” by Antonia Mulas, broadcast on RAI Tre on 12/25/1984). The Show will be accompanied by a Catalog, published by Mousse Publishing, featuring Detailed Photographic Documentation of the Exhibition, as well as Contributions from Germano Celant, Lisa Le Feuvre and Pietro Rigolo, and Detailed Entries on all the Works on Display.